For many years, antiques shops would always have appeared on television with some form of taxidermy in the window. 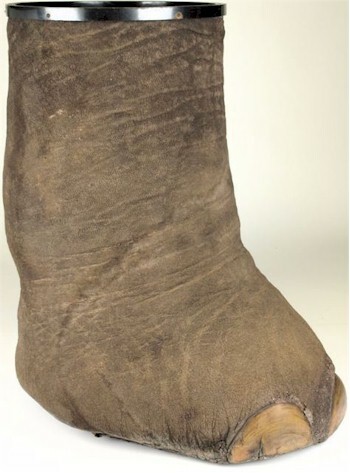 More often than not this would have been an elephant's foot, elephant stick stand or a tiger skin rug. Fortunately, there has been a decline in big game hunting, which has lead to a rise in the value of Victorian and Edwardian taxidermy animals, representative of an earlier age. An elephant foot stick stand by Rowland Ward. Two of the best known companies that supplied taxidermy at the turn of the century were Roland Ward of London and Van Ingen & Van Ingen of Mysore. Depending upon the size, a good example of an elephant's foot stick stand by Roland Ward would be in the region of £400-£500 at auction. At their peek, Van Ingen & Van Ingen produced over 400 Tiger skins a year, mostly for Indian Royalty. The example shown below recently sold at auction for £1,300. 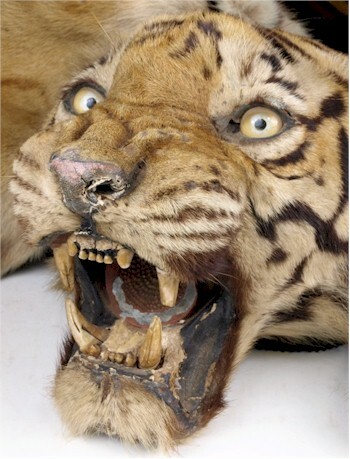 A Tiger (Panthera tigris), full skin and head-mount by Van Ingen & Van Ingen, which was sold for £1,300 in the Taxidermy section of a Sporting auction. 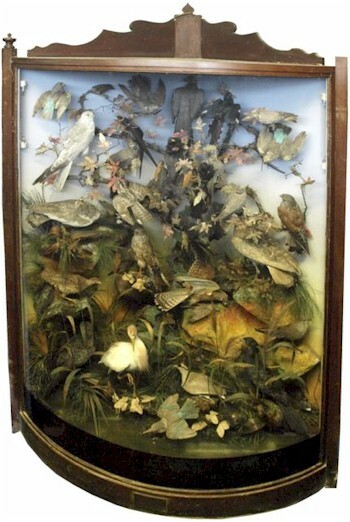 Some of the most popular taxidermy pieces in Britain during the 19th century were cased birds and fish. Individual specimens are often found for as little as £30-£40, ranging to larger display cases with collection of birds for several hundred pounds. An early 20th century library display case of south African Birds, which sold for £700 in the Taxidermy section of a Sporting and Collectors sale. Taxidermy was, perhaps, the only way of recording record catches by fisherman at the turn of the century. One of the best taxidermists of the period was Cooper of London, whose work is of particular quality. The naturalistic setting of Cooper's work sets it apart from many others of the period, thus leading to higher prices for similar sized catches to other taxidermists. Mounted taxidermy heads are still as popular with collectors today as they have been for many years. Fox heads are, perhaps, the mostly common found at auction due to the history of field sports in England. 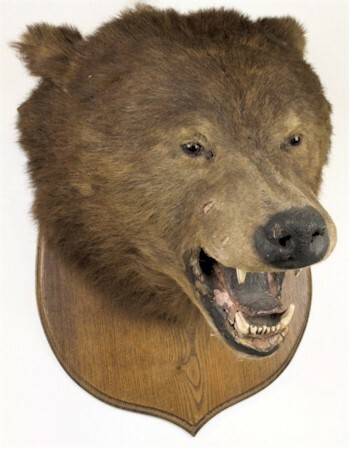 This mounted Brown Bear's head, which sold for £700 in a Sporting Auction, is typical of the taxidermy offered in our Sporting sales. Not only do fox heads turn up at auction, but an interesting array of taxidermy heads can be found hidden away in properties around the country. Changes in attitude towards hunting is probably the main reason many people no longer have taxidermy heads on display. Taxidermy heads that come in for auction attract a great deal of interest for those looking for a more unusual present. The Brown bear head on oak shield seen above sold for £700, mounted fox heads range from £40-£60 upwards, particularly for an example by Rowland Ward or Spicer. Certain species are subject to regulations under CITES (Certificate of International Trade of Endangered Species) and may not be imported or exported outside of the United Kingdom and EU regulated areas. Other natural history and taxidermy specimens are restricted from sale at auction under these regulations also. Full details can be obtained www.cites.org.